Although the Photometric lights work very well with the Arnold renderer, the 3ds Max software provides you with Arnold lights that are specifically meant to be used with this renderer. It has parameters that are geared towards rendering using Arnold. 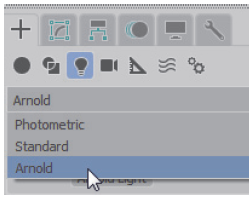 You can open the Arnold lights from the Command Panel’s Create panel ( )> (Lights) by selecting Arnold from the list, as shown here. 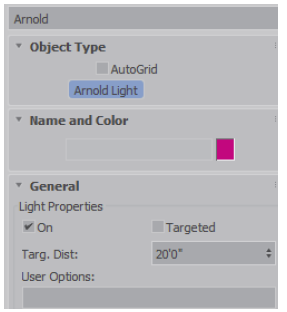 In the Object Type rollout, click Arnold Light. In the General Properties rollout, you can toggle the light on or off. You can also set the light as either free or targeted. By default, Targeted is cleared, which automatically creates the light as a free light. In the Shape rollout, you can select the shape of the light. The shape selected controls how the light is emitted. 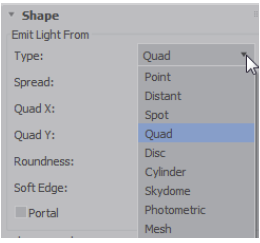 By default, the Quad option is selected, which illuminates a rectangular area and emits the light only in one direction. The parameters in the Shape rollout are based on the type of light selected. The shape selected controls how the light is emitted. By default, the Quad option is selected, which illuminates a rectangular area and emits the light only in one direction. The parameters in the Shape rollout are based on the type of light selected. 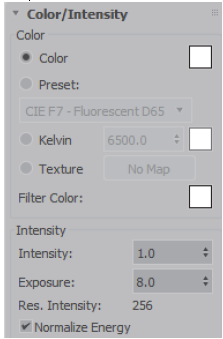 In the Color/Intensity rollout, you can set the color of the light source. Typically, you are required to adjust the Intensity or Exposure of the light source to get a good render of a scene. Exposure is an intensity multiplier and increases the intensity in multiple jumps. In the Rendering rollout, you can adjust the quality of specular highlight and shadows. Increasing the Samples value reduces the noise in shadow areas, but increases the render time. In the Shadow rollout, you can toggle the casting of shadows from the light on or off. 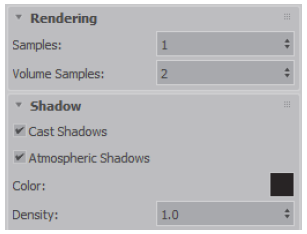 The Atmospheric Shadows option controls the calculations of volumetric shadows. In the Contribution rollout, you can use the advanced options to control the aspects of light contribution in the final rendering. 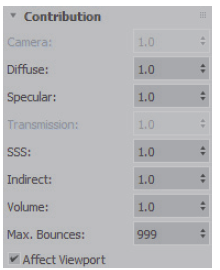 For physically accurate results, the various values should be left as a default of 1.0 and for Max. Bounces as 999. You can change those options for artistic control. This is a short excerpt from ASCENT's learning guide, Autodesk 3ds Max 2019: Fundamentals.